Adorable video of “Twinkle Twinkle Little Star” in Japanese (“きらきらぼし”). Sing it with your kids today! The 1-year anniversary of March 11, 2011 (the big Japan earthquake) is coming up. If you purchase this song HERE, 100% of the proceeds will go to disaster relief and support for Japanese children. 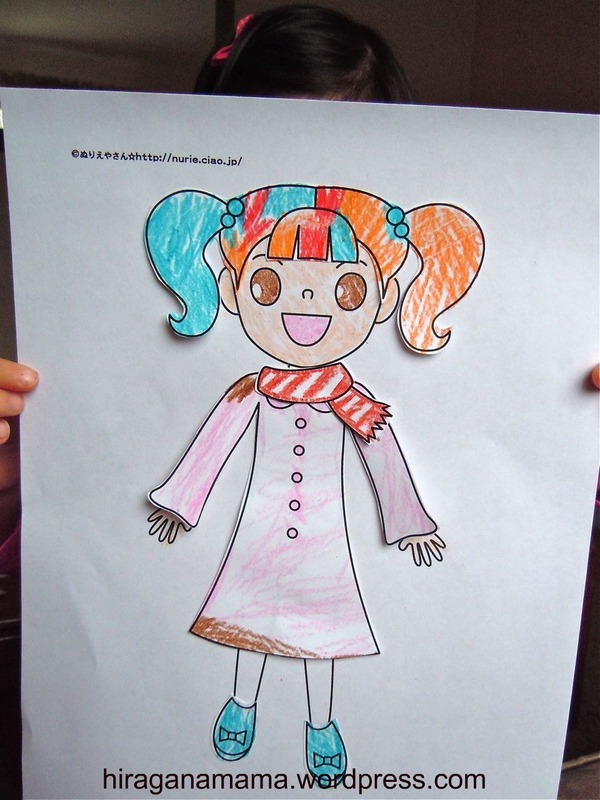 Here are some activities to do with your kiddos with the kana き! 1. Fold an origami きりん(giraffe) here at Origami Club. 2. Print and practice writing き　here from Nifty Kids. 3. Coloring pages of words that begin with　き here, at Nurieyasan. 4. Learn and sing the きんたろう／Kintaro song here. When I was a little girl, I loved playing with 着せ替え人形 (kisekae-ningyou). They are paper dolls that you dress up. In Japan, they sell kisekae ningyou books where you can punch out the dolls and their coordinating clothes and accessories. Inexpensive fun for little girls. 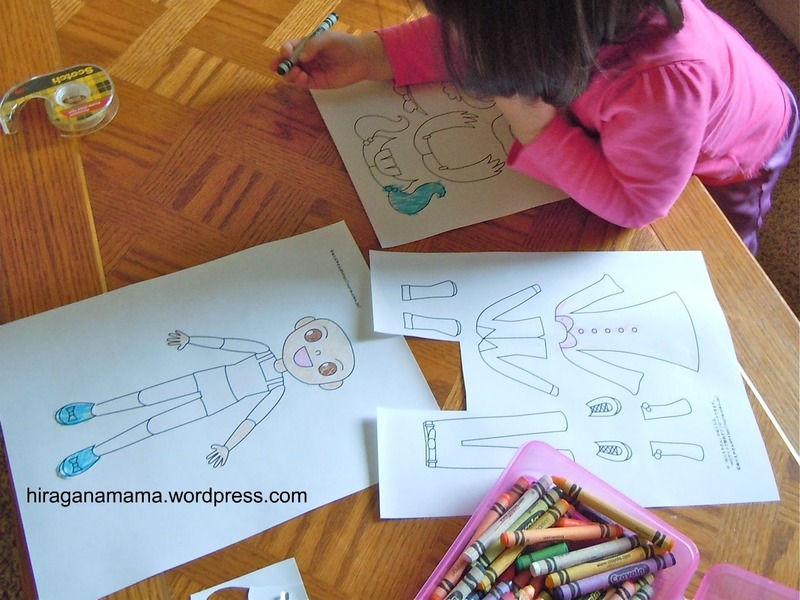 It was a great opportunity for me to review colors, body parts, and the names of clothes with my toddler as we worked on coloring, cutting, and putting together our paper doll today. I imagine older girls (3rd-5th grade?) would have even more fun with きせかえにんぎょう, because they can then even design their own clothes, make outfits coordinate, and so on. Plus you wouldn’t have to cut everything out for them. Here are some links to Kisekae Ningyou! 2) If you have a color printer, there are a whole bunch at NIFTY! I especially like this one. 3) Zowie’s Room has really cute kisekae, but they are pretty small, so probably not for the preschool crowd. I love this set– very traditional Japanese clothes. Zowie’s Room also has a lot of other free printables that are worth checking out! 5) You can play kisekae online at NIFTY (キララちゃんきせかえ） if you don’t want to have to deal with the mess that paper dolls can create. Any others resources I’m missing? Did you love this as a little child? Please share!